On the 30th July we had the pleasure of being a stallholder at the annual Nottinghamshire Pride. 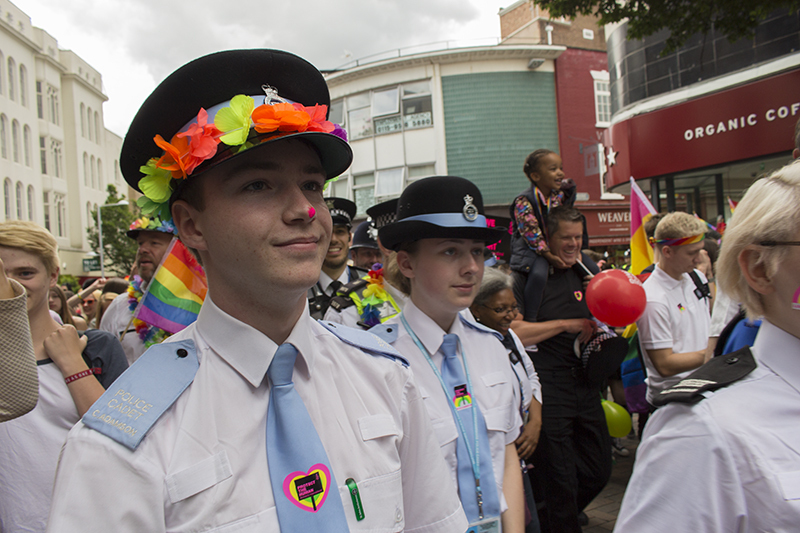 The event is a celebration of diversity, unity and human rights; it bring together members of the LGBT community, voluntary and statutory organisations with the general public to put out the positive message that everyone should feel comfortable with who they are and that love should not face prejudice. As usual, the event started with the parade, which attracted thousands of people from all walks of lives. Live drumming, marching bands, dancing and positivity were all part of the parade, as well as a minute of silence for the victims of the Orlando shooting earlier this year. The celebrations continued with entertainment provided by the local artist such as Goa Choir, Vivienne Lynsey and We Are Family (Orlando Tribute) and ended with after parties all over the city. Our stall was a real success, with hundreds of people engaging with our Building Stronger Communities project and especially with our new Quick Guide to Reporting Hate Crime. We also gave people the opportunity to tell us what they think about their experience of Pride and why such events are important by allowing them to leave written messages on our paper tablecloth. Our stall was also visited by the young people from Centre Place Bassetlaw, whose expenses we covered to allow them to attend the event. Other stalls included Nottingham City Homes LGBT Forum, Victim Support, British Transport Police and Unite Union. Please see photos from the event below and follow this link for a short video summary of the day.